Manitoba Education and Training is committed to increasing high school graduation rates and student success across the province. 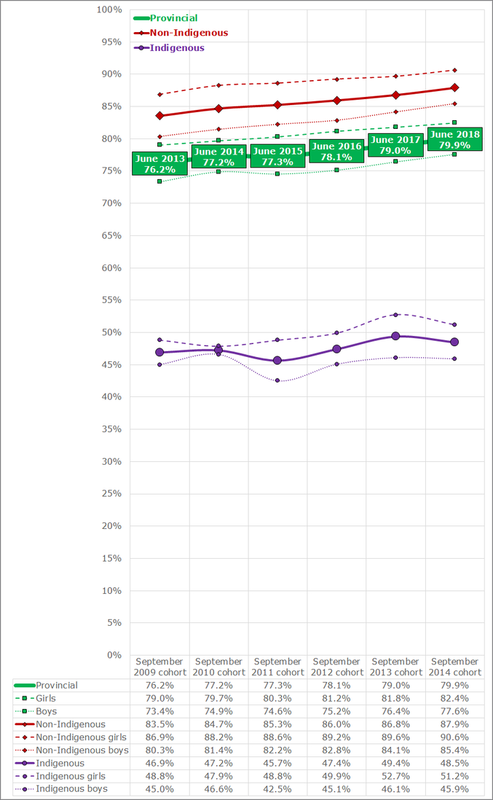 To understand where we are making progress and where improvement is still needed, we need to examine our data on student achievement in a variety of ways. High school graduation is generally viewed as the minimum requirement for pursuing additional education and for entry into the world of work. Manitoba's student-tracked method of calculating high school graduation rates allows us to understand how long it takes for individual students to graduate and to help us identify certain achievement gaps, such as those between male and female students and between Indigenous and non-Indigenous students. High school graduation in Manitoba typically occurs within four years of beginning Grade 9. This is referred to as “on-time” graduation. For some students, and for a variety of reasons, taking more time to obtain their credits for graduation could make the difference between successfully completing high school or not. This persistence to graduation is referred to as “extended-time” graduation. Manitoba’s four-year student-tracked high school graduation rate for 2018 is 79.9%. For non-Indigenous students the rate is 87.9% and for Indigenous students it is 48.5%. 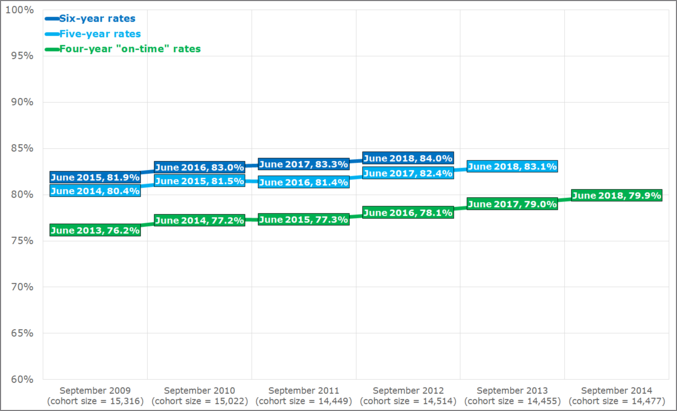 The average improvement from a four-year “on-time“ rate to a six-year “extended-time” rate is about six-percentage points. Note 1: These figures include only students from public and funded independent schools. They do not include students from non-funded independent schools, or those in schools that do not fall under the Public Schools Act, such as First Nations schools (including those administered by Frontier School Division under educational agreements), or Adult Learning Centres. Note 2: These figures reflect attrition rates based on Statistics Canada’s estimates of population, deaths, and mobility/migration as of February 28, 2019. Thus, simply multiplying starting cohort sizes by graduation rates will not yield the number of graduates. Note: Every year, parents of new or continuing students can indicate if they are declaring their child’s Indigenous identity for the first time, or altering their child’s previously declared identity, or confirming that a previous declaration had been made. 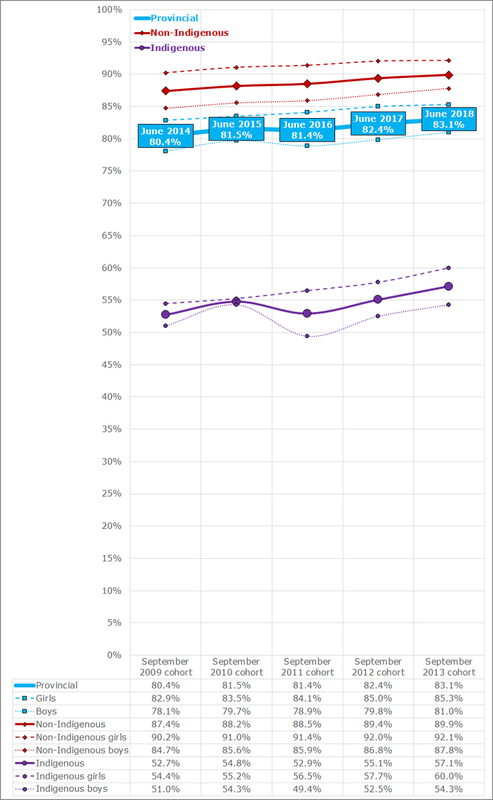 To determine Manitoba’s student-tracked high school graduation rates, Manitoba Education and Training (MET) follows individual students in public and funded independent schools from Grade 9 and calculates the percentage who graduate within a certain amount of time. The rates do not include students from non-funded independent schools, First Nations schools (including those administered by Frontier School Division under educational agreements), or Adult Learning Centres. The difference between the calculated rates and a 100% rate is not the high school dropout rate. While the difference would include students who have actually disengaged from attending school, it would also account for students who have transferred out of public and funded independent schools to enroll and potentially finish high school in non-funded independent schools, First Nations schools, and Adult Learning Centres (ALCs). Until 2016, MET also published a proxy cohort high school graduation rate, which was a ratio of the total number of graduates reported by public and funded independent high schools at the end of every academic year to the total Grade 9 enrolment in these schools four years prior to the year of graduation. 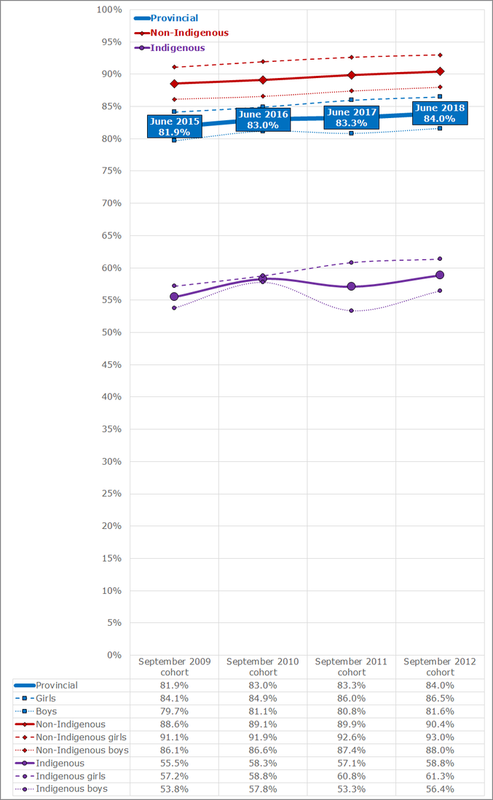 The proxy cohort rate had many limitations from a policy and analytic perspective and MET used it as a temporary indicator while developing capacity to produce a student-tracked rate. Thus, MET has discontinued the publication of the proxy cohort rate and will only produce a student-tracked rate moving forward.